Klondike and I recently spent a few fun- and friend-filled days in my favorite big city, Chicago. We had a marvelous time; how could you not when there’s theater and deep-dish pizza and the original Marshall Field’s store (which I refuse to acknowledge is now a Macy’s)? 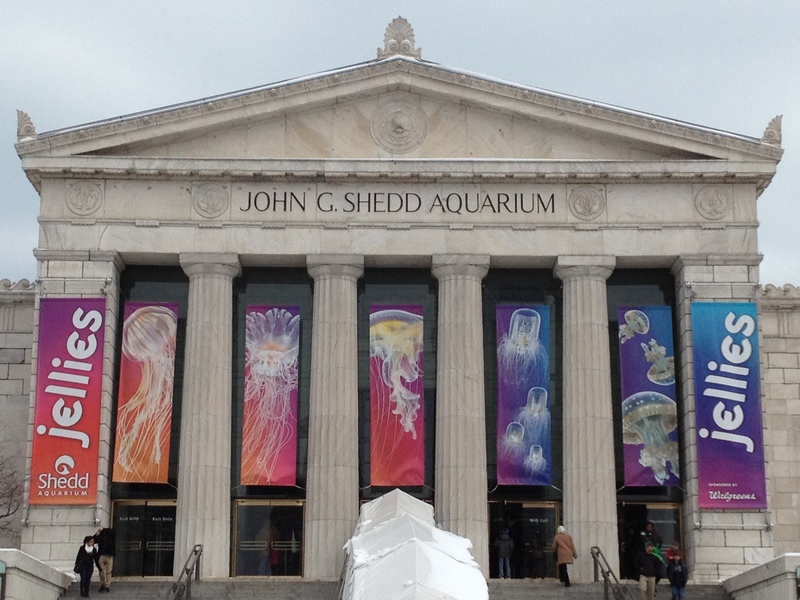 It was a thoroughly marvelous time, with one glaring exception: our trip to Shedd Aquarium. The aquarium is wonderful, and we had a splendid time once we got tickets, but actually getting tickets was beyond absurd. I had scoped out the situation online a few weeks before our trip, but I actually found their site sort of confusing and couldn’t determine what level of ticket we would want, so I figured we would just buy them when we got there, understanding we might have to stand in line for a bit. A bit? HA! There’s a big plaza in front of the aquarium. When we got there around 12:30 on Saturday, the line extended down the stairs from the entrance, up one side of the square, across, and then back up the other side, in a giant U. I ca n’t even begin to guess how many people were waiting. But the line was moving, slowly but steadily, so I felt pretty optimistic in spite of the chilly temps and biting wind. Forty minutes later, we had made it up and across and just had up the last side and up the stairs until the promised land of INDOORS. That’s about when the line stopped moving. Every once in a while there would be a brief forward surge. Slooooooowly across the plaza, finally to the stairs, where there was a tent so we had a little shelter from the wind. Very, very, very slowly up the stairs, and into….the vestibule! More waiting, with no idea what lay beyond. Eventually through the revolving doors into the lobby where we were met with…a rat maze to wait in to buy tickets! Oh, yes, and we were greeted with a sign telling us that all the aquatic shows for the day were sold out. Total time to get in and buy tickets? Approximately 2.5 hours. The facility kept throwing salt on the wound, too. We went to put our coats into a bank of lockers that only accepted quarters, and the change machine was out of service. We wanted to buy a soda, and the machine wouldn’t accept cash (out of service) – we had to use a credit card. To buy a soda. In the end we had a great time; the jellies exhibit was super cool, and how can you not love seeing dolphins and beluga whales and otters and penguins and turtles and sea horses? But it felt like perhaps the least tourist-friendly tourist attraction I’ve ever been to. Oh, and did I mention that if we had purchased our tickets online the day we went, there would have been a FIFTEEN DOLLAR SURCHARGE? Each. I live someplace where everything is cheap, so maybe I just had Big City sticker shock. 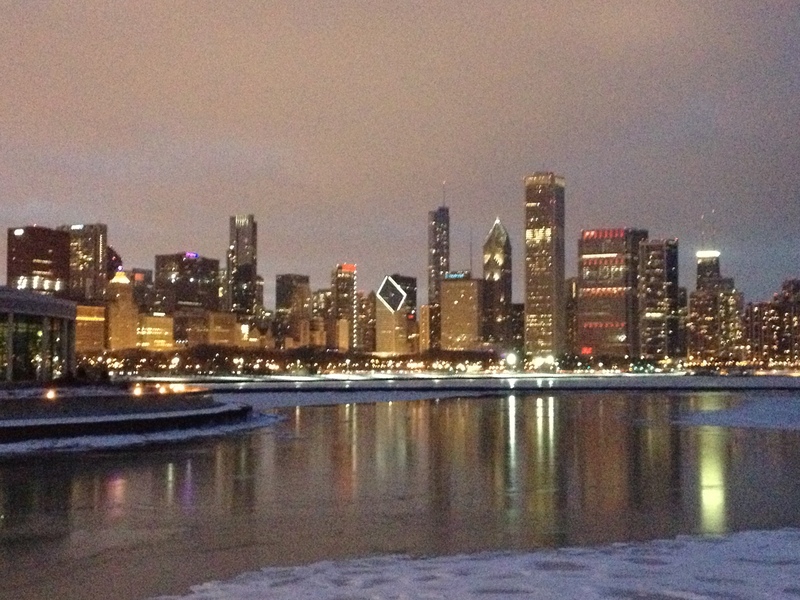 To find out, I did a little comparison shopping of the other big attractions in Chicago. Shedd: $8 basic, but that doesn’t include half the exhibits and you can’t add the jellies exhibit (which costs more) to that ticket. 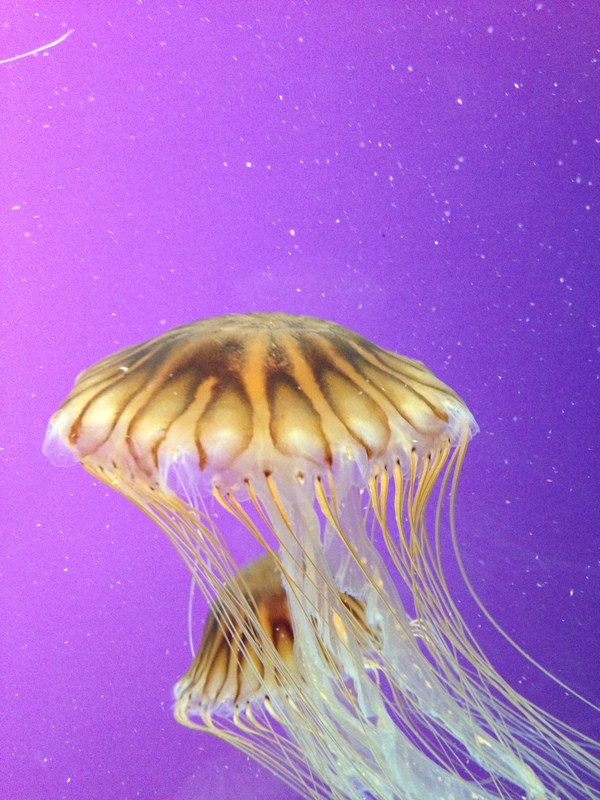 $28.95 for all exhibits PLUS $3 for jellies. Also, $4 for aquatic show, which was sold out. So yeah, Shedd is steep. To feel so under-appreciated as a visitor was a drag for almost seventy bucks. Here are some of the ideas that occurred to us during our hours-long wait that they could have done to improve the experience. 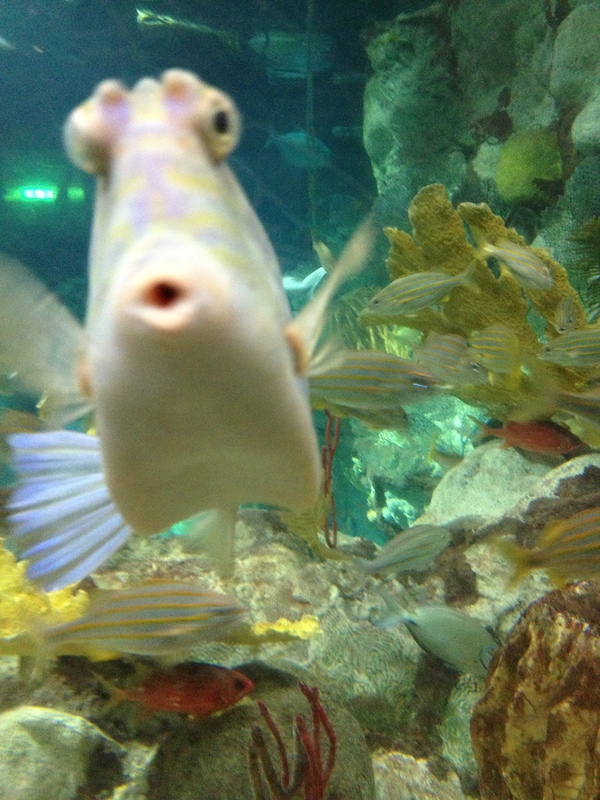 To those of you at the Shedd who are surely reading this, please feel free to claim these ideas as your own. Be a hero in the office. Encourage more people to buy tickets online ahead of time. If the website had told me to expect a 2+-hour wait, I would have worked harder to figure out which tickets we wanted. You know those signs they have at Cedar Point and probably every other amusement park in the world that say, “Your wait from this point in line is 8 million years”? GET ONE. If we had known what we were getting ourselves into, we might have bailed. Of course, we’d just paid $19 to park the car, so maybe not. But at least we would have been informed. You could give out wristbands or tickets or numbers or something so we could go sit in our car to stay warm for the first hour or so. Make us aware of the Go to the Head of the Line option sooner (rather than after you’re already 2/3 of the way through the line), especially if you’re going to charge 50% more for that option. You could – hold on, this is a wild idea – HAVE MORE PEOPLE SELLING TICKETS ON BUSY DAYS, like, say, Saturdays. As far as we could tell, the only reason it took so long to get in was because it took so long for tickets to be purchased. Perhaps you were at capacity at some point. I have absolutely no idea because you provided zero information. Act like you’re happy to see us. When we finally make it to the person waiting to take lots of money from us, have her acknowledge how nice it was for us to wait so long to see your fishies. Make sure once we’re inside, everything is PERFECT. If that means loading more quarters into the change machine by the lockers midway through the day, do it. It’s not rocket science, people, it’s customer service. If there’s one thing I hate, it’s when someone treats a captive audience like that’s what they are. Be better than that. Wow me with how well you handle the situation rather than shrugging your shoulders and letting us stew and fret. In the end, we spent as much time waiting to get in as we did enjoying the exhibits. And we did enjoy the exhibits. Really, truly. I highly recommend the aquarium. I also highly recommend buying your tickets in advance. Don’t say I didn’t warn you. Otters & penguins & whales oh my!